Yup - there's another 'new' foot bath kid called the Ionic Foot Bath Detox! For the record we're not experts in this stuff. We're just your reporters sharing the results of our research, excitement and most importantly - our experience with it! When you cut through all the marketplace hype, confusion and yes - controversy - we think there's some pretty good things happening here. Let's take a look. An ionic foot bath detox gets us into the area of alternative, holistic or natural medicine. Things like energy pathways, free energy flow, energy body stimulation and body cleansing. Ancient Eastern medicine has long believed that our feet contain reflex zones that provide energy pathways into our whole body. Let's assume you feel your best when your body is 'in balance' and properly energized. The body's natural, healthy, balanced state is an alkaline one with a negative ion energy charge. Your immune system is functioning at its peak. Messing this up is the fact that we're all exposed to many pollutants, heavy metals and toxins in our daily living. They're absorbed through our skin and lungs or injested. These tend to hold a positive charge that reduces the natural alkalinity of your body. As these build up they can cause serious health concerns and weaken your immune system. The body has its own natural defences for this. Your liver, colon, lungs and kidneys do a pretty good job if things are normal. Their function can be compromised when your body gets bogged down with excessive amounts of those 'nasties'. How An Ionic Foot Bath Detox Works! In a nutshell you're running a mild electrical current through electrodes or arrays in a weak salt water solution in your foot bath. This releases negative and positive ions as the water molecules are 'broken down'. The net result is a buildup of ions in the water and an electromagnetic field is created between your body (feet) and the ions. NOTE: There are various opinions and theories on what happens next. The most likely explanation we've found is that the buildup of negative energy is absorbed using the natural energy channels or meridians via the reflex zones of your feet. It appears that this ionic foot bath detox action helps 'recharge' your body energy with negative ions. In turn this helps the natural body processes in cleaning out toxins naturally through their normal functions using organs such as the kidneys, liver, skin, lungs and colon. There may be a modest amount of 'detoxifying' take place through the feet. Some believe that the negative ion charge in the foot bath draws out the toxins by osmosis. It's a bit hard to find conclusive medical or scientific evidence to back this one up. The colour change of the water is often cited as evidence of this. To this we say 'Hold on a bit bunky'. To us the reality more likely has a lot to do with the fact that the electrodes give off particles when current is passed through them and this has a lot to do with the color change. It seems most of the detoxifying benefit comes about by improving the health, function and energy in your body's natural defences. They in turn are able to better do their natural job of cleansing and detoxifying. In short the main benefit of an ionic foot bath detox really seem to come from a raw energy infusion from the negative ion field built up in foot bath water. Here's a list of benefits that are backed up by facts, reasonable assumptions, observations and reports combined with our own personal experience. Quicker recovery from injuries and surgeries. Helps relieve arthritic pain and joint pain. Unblock meridian energy flows and energy blockages. So what is one supposed to do with all of this info? We feel it necessary to be respectful of and sensitive to the practices of older cultures including energy flow, acupuncture, acupressure, cleansing and various other holistic health practices. Our ionic foot bath detox has always left us with a very real and heightened sense of well being. Everything seems to work better and life is more positive for us. For us it appears to work. How and why may have to remain 'fuzzy'. Why not try it for yourself. You be the judge. Here is the unit that did it for us. Yup! 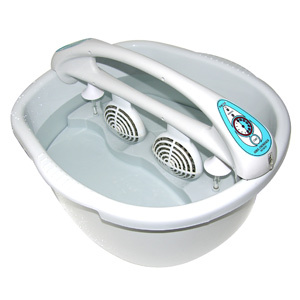 That's a picture of our little ionic detox foot bath servant - the Rejuvenix Ionic Detox Foot Spa. We've found the experience very pleasant and enjoyable. There's almost a lightness to our feet and a definite sense of more energy. Even for us old fogies it seems to add a lightness and spring to our step. Sessions can last from 30-45 minutes. You should start with a shorter time of 15-20 minutes until your body adapts to this experience. You may feel a slight tingling in your feet and legs. This is normal. 1-2 sessions a week to start is more than enough. Once you're in a rhythm once every 2 weeks seems just fiine. If your goal is to just reach a good maintenance level for toxin removal after your initial sessions, then once every 3-4 weeks should be fine. You should drink plenty of water both before and during your session. It's a great way to end your day. You'll feel both relaxed and energized! NOTE: These things use electrodes that wear out with time. Typically 25-30 sessions. So if you have the opportunity you might want to 'stock up' on these when you first place your order. You also get a nice price break that way. If you have any health or foot problems at all, check with your health care provider first! You should not use these devices if you have a heart condition or pacemaker without checking with your doctor. You should avoid taking any medication or alcohol for at least an hour before a session.